The Invictus Games Foundation and Sport Industry Group have come together in partnership to help create career opportunities for wounded, injured and sick servicemen and women in the sport industry. 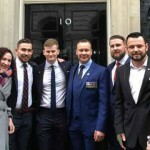 The initiative, which was announced in front of an audience of 1,750 leading figures from the world of sport business, called for organisations across all sectors of the industry to give the talented men and women of the Armed Forces a platform to reach the next stage of their careers. Prince Harry said: “Everybody here knows the power of sport and what it can achieve for anybody especially those with injuries. What we’ve simply done is create a platform where these guys can use sport for rehabilitation – either physical or mental. It’s a platform where they are not forced into doing anything, it’s all their own choice, it’s being part of a team again, to wear a uniform again, it’s a huge step. 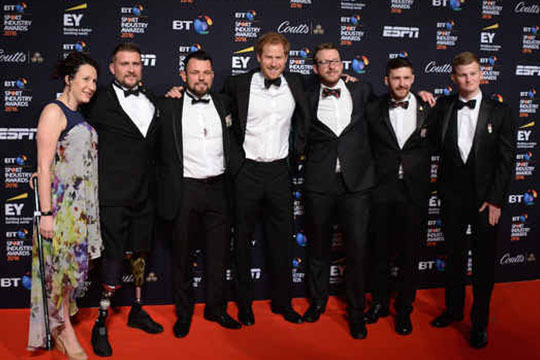 Prince Harry was joined onstage by six Invictus Games competitors, past and present; each shared their personal journey from service, to the Games, and beyond. One of the individuals was John-James Chalmers, known as JJ; in May 2011 JJ was seriously injured by an IED, which also claimed the lives of two of his colleagues. 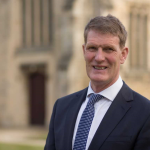 After undergoing extensive reconstructive surgery to overcome his injuries JJ immersed himself in the world of sport, representing the British Armed Forces team in Athletics and Cycling at the 2014 Invictus Games where he won a Gold medal. JJ has since moved into presenting and is doing lots of work with Channel 4 ahead of the Rio 2016 Paralympic Games. JJ’s story represents what The Invictus Games Foundation and Sport Industry Group are trying to achieve; creating employment opportunities for these talented and determined individuals. Guests were encouraged to support the work of the Invictus Games Foundation through a text donation on the night raising much needed funds for these opportunities. The announcement of the partnership between the Invictus Games Foundation and the Sport Industry Group was one of many highlights of the evening that also included Prince Harry presenting the Outstanding Contribution to Sport Award to the Murray Family for the impact they have made in the world of tennis and beyond. Kevin Cahill was presented with the Coutts Lifetime Achievement Award for his work at Sport Relief and The Leadership in Sport Award, in association with Nolan Partners was awarded to The FA’s director of participation and development Kelly Simmons MBE for her contribution to the women’s football and the national game. A total of 17 awards were given out on the evening, celebrating the best of the best from marketing, PR, sponsorship, community investment, event, social media, digital and innovation from across the world of sport. BT is the Headline Partner of the BT Sport Industry Award. Official Partners are Coutts, ESPN and EY. For more information on the event visit www.sportindustry.biz, and follow @SportIndustry #BTSIA.